Heritage’s revival as a respected academic subject has, in part, resulted from an increased awareness and understanding of indigenous rights and non-Western philosophies and practices, and a growing respect for the intangible. Heritage has, thus far, focused on management, tourism and the traditionally ‘heritage-minded’ disciplines, such as archaeology, geography, and social and cultural theory. Widening the scope of international heritage studies, A Museum Studies Approach to Heritage explores heritage through new areas of knowledge, including emotion and affect, the politics of dissent, migration, and intercultural and participatory dimensions of heritage. "This new edition of People of the Earth continues the highly authoritative and well-written coverage of Brian Fagan’s thorough and accessible introduction to global (pre)history. Now with coauthor Nadia Durrani, the volume captures our humanity’s identity through deep time and our earthly space in a factual narrative readily intelligible to a broad readership. From our human origins 7 million years ago to the Shang Dynasty of China, we are taken on a time-traveling machine with numerous layovers, surprises and counterintuitive storylines." Sheila Watson is an Associate Professor and Director of the MA/MSc in Heritage and Interpretation by Distance Learning in the School of Museum Studies at the University of Leicester, UK. Amy Jane Barnes is Research Associate in the School of Archaeology and Ancient History at the University of Leicester, UK, a University Teacher at Loughborough University, UK, and an affiliate of King's College London. Katy Bunning is a Lecturer and Director of Teaching and Learning in the School of Museum Studies at the University of Leicester, UK. 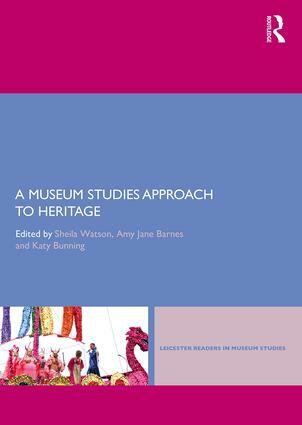 Leicester Readers in Museum Studies was launched in 1994 under the editorship of Professor Susan Pearce, the then Head of the Department of Museum Studies. Having continuously developed subject bibliographies since its founding in 1966, in the late 1980s the Department converted these into study packs of published materials for students. These became the basis of the first series of Readers. It was determined that each volume should have a strong editorial vision which would be expressed in a significant introductory essay and in section introductions. Professor Eilean Hooper-Greenhill followed Sue Pearce as series editor. In 2007, Simon Knell became editor of a newly designed and more thematically diverse second series. He invited editors from outside the Leicester department. To produce edited volumes for students, professionals and others who wish to obtain an overview of contemporary thought and practice in the fields of museum, gallery, heritage and curatorial studies. To edit volumes composed entirely or almost entirely of new work. This new work includes writing that seeks to survey, curate and summarise an area of interest; it need not be work that seeks to innovate. The series will also consider the inclusion of previously published work where this work might currently be viewed as obscure, inaccessible or only published in a foreign language. To shape volumes with a strong editorial vision that include a substantial and authoritative introduction that reflects on the content of the book and the book’s subject. It is expected that all books in the series will have a strong sectional structure and include section introductions. To embrace the Leicester vision for inclusive and egalitarian engagement. Contributions to the series may seek to criticise, deconstruct or analyse hegemonic positions and hierarchies, though it is not a requirement to do so. The series will not seek to sustain them. If you have an idea for a book that you think would be appropriate for the series, then please contact the Series Editor, Simon Knell (simonknell@leicester.ac.uk), to discuss further.